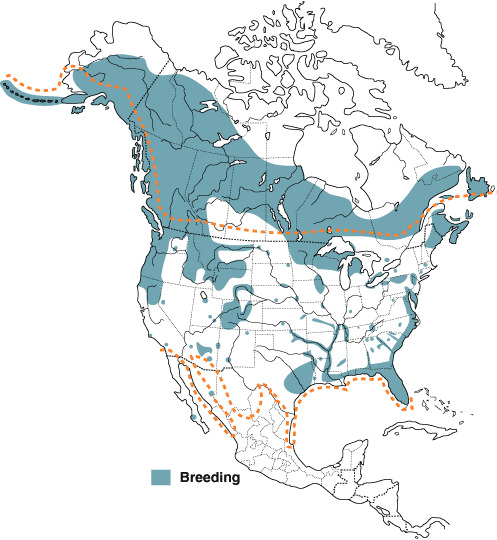 Breeding distribution of the Bald Eagle. Source: North American Birds Online, Cornell Lab of Ornithology. The recovery of our national symbol, the Bald Eagle, is considered one of the greatest conservation successes of the 20th century. The 44 nesting pairs counted in Maryland in 1977 represented an all-time low for the state. As actions were taken to reduce the declines (e.g., banning harmful pesticides like DDT), Bald Eagle populations recovered to the point that they were removed from the federal threatened and endangered species list in 2007. Today, the Chesapeake Bay region is home to the largest concentrations of Bald Eagles in the lower 48 states, with an estimated 600 or more pairs currently breeding in Maryland. In 2014, three pairs were even found nesting within the District of Columbia! Breeding distribution of Bald Eagles in Maryland during the first Breeding Bird Atlas, 1983-1987. Source: Atlas of the Breeding Birds of Maryland & District of Columbia, Robbins and Blom 1989. Breeding distribution of Bald Eagles in Maryland during the most recent Breeding Bird Atlas, 2002-2006. Source: Second Atlas of the Breeding Birds of Maryland and the District of Columbia. Ellison 2010. The Bald Eagle nesting season in Maryland starts in October, with pair formation and construction of large stick nests in the upper crotch of tall trees. Eggs are usually laid in February, but pairs in southern parts of Maryland occasionally start laying their eggs in January. The clutch of 1-3 eggs usually hatch by mid April, and the nestlings fledge out of their nest in May-June. You can learn more about the natural history of Bald Eagles at Encyclopedia of Life, Cornell Lab of Ornithology All About Birds, and Birds of North America Online.